Thanks to Ibu Kat who is responsible of the GreenSpeak section of Bali Advertiser for her correct explanation about termites and to grant Freemite as the solution to get rid of Termites. Indeed Freemite is at our knowledge the only termite treatment organic and non toxic that is proved efficient by Official tests based on Japan Industrial Standards. The core of our team in Nusa Penida for a spiritual trip few days ago. We shared and prayed in the key balinese temples of Nusa Penida before sleeping together in the famous Pura Dalem Ped all together. An amazing and merited 2 days relax trip after the completion of 11 bamboo buildings and 9 months work. Drying and cleaning bamboo area next our main warehouse in Gianyar. Each bamboo comes from the best place (depends on the season, altitude, species) thanks to the ancestral balinese knowledge that come to us through oral tradition. An huge and precious knowledge already lost in some other asian countries...Each bamboo is chosen one by one for every purpose of construction before the traditional one month process of preparation. Then they can be treated and used in construction production. 2012 project for Delmango in Seminyak. Dome 17m diameter and 2,5m skylight. Architect : Pak Ketut Arte. Structural engineer : Eugene Baikoff. In house team of 30 specialized bamboo craftmen topped by a senior onsite team coordinator and a dedicate civil engineer at office. Excellent exchanges at the world bamboo summit, Saigon. http://www.damyangbamboo2015.kr/sub/?subKey=0102000000 will be the biggest event ever organized Bamboo. Thanks to www.wasmoethwildlife.org CV Alam Senang is building the full bamboo eco resort of the project on an island of the Congo River in the middle of Africa. More than 40km of bamboos are now on 24/24 process of treatment with Freemite in our new production facilities in Gianyar, Bali. The Freemite team take advantage of this process to improve our anti termite protection efficiency. Invite you from 19th to 22nd April to the Expo Building Solution for Life. from 11 to 13 april 2013. We will have there a co branded booth with EcoSmart our Bali Green team Cies. Welcome to share and know more about the latest developments on our organic Termite treatment. in Jalan Dewi Sri, gang "Kawasaki", Kuta, Bali just 200m from our former workshop and office. Welcome to our new distributors for Freemite Termite Treatment in Jakarta Selatan with contact person Mr. Ambar Suryo Lelono and also in Tangerang Selatan with contact person Mr. Bharat Kumar Murjani. Freemite proudly support the success of the first harvest of bamboo sprout project initiated by Professor Diah Kencana of University Udayana in order to plant 300 Ha of Bamboo in Bali with Bapak Bupati Gianyar (Photo). ecoBali and Kompos Bali have joined hands to provide you with complete composting systems that suit your requirements, are easy to maintain, and make composting a totally rewarding choice. Freemite is a part of the system as an anti-ant treatment. New Freemite200 is now available ! The test of Freemite made on Termite, Powder Post Beetles and Woodworm that have been performed by the National Laboratory of University Udayana of Bali ( based on SNI and ISO Standards) proves the efficiency of Freemite. Don't hesitate to contact us for the detailed result of the test. Bamboo structure in Batur, Bali, June 2012. Design by Juan Schlosser. Structure 100% made from bamboo for a cultural event in Bali. Design by Juan Schlosser (www.nauart.in) All bamboo were treated with Freemite for termite protection. Freemite & Asali Bali our department's of bamboo construction were honoured to be partner of Children's Environmental and Health Awareness Program organized by Role Foundation that is efficient yayasan that we recommend you to support. Official: Freemite is efficient on Termite, Powder Post Bettle and Woodworm. At least the answer of one of the most important question about our Organic Termite Protection. The tests made on Termite, Powder Post Bettles and Woodworm that has been performed by the National Laboratory of University Udayana of Bali ( based on SNI and ISO Standards) show an indiscutable efficiency of Freemite. Don't hesitate to contact us for the detailled result of the test. A new step of the close collaboration between Little Tree and Asali Bali The Bamboo building departement of our Company. We built booth in Bamboo for The Little Tree Green Expo Center in Sunset Road, Bali in order to receive their new eco friendly partners. The construction is treated by our organic Termite Treatment. Pak Ketut Artika Chief of Public Work Departement of Bali showed his great interest on Freemite as the organic solution for Termite Protection and Pest Control during the opening of "Indonesian Building Technology Expo" in Bali (March 2012). FreeMite starts its strategic partnership of distribution with Atmos Indonesia at the Indonesia Building Technology Expo 2012. Manik Organik, an organic shop and cafe that sells organic and healthy products, now adds FreeMite as one of their products. To support our mission to establish a reliable distribution network in Indonesia, FreeMite organic and non-toxic termite treatment opens a new branch in Jakarta. In partnership with Analytic Laboratory of Udayana University Bali, FreeMite was invited to participate in APRCC 2011 (Asia Pacific Responsible Care Conference) that was held in Grand Hyatt Hotel, Nusa Dua, Bali on 26th - 27th October 2011. FreeMite100 was introduced as an eco-friendly solution for termite exterminator. Using nano technology, FreeMite100 has more concentrate that makes it more efficient. 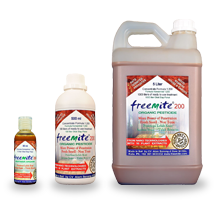 With 12 plant extracts addition, FreeMite100 is very powerful to kill termites. We have just received the certificate from the official Indonesian laboratory of the University Udayana that shows FreeMite is non toxic. Please contact us for a copy of this certificate if needed. Green Pest Control in Canggu, Bali that are parasite exterminator specialists uses now freeMite as an organic pesticide for houses and garden to complete their range of products. freeMite20 is now available in a 20 times stable concentrate formula. Only add 19 Liters of clear water to obtain 20 Liters ready-to-use termite treatment. freeMite20 new formula include an organic anti-bacteria compounant that avoids most of odors. Your termite exterminator treatment is now free of odors. Welcome to LITTLE TREE. The new and already famous center of green and eco-friendly products in Bali is now official dealer of freeMite in Indonesia. freeMite has been accepted in the catalogue Little Tree after a study of the product manager team of Little tree. You can now find freeMite termite treatment JL sunset Road 112X, Kuta, Bali. a display made yellow and black bamboo Tali is now offer to any purchase of 70 liters or more of freeMite termite protection treatment. A full display is composed by one container 25L, 2 containers 5L, 20 containers 1L, 30 containers 0,5L). It is a constant goal of our team to improve the marketing of the selected distributors of freeMite. This display include a documentation distributor on fremite termite treatment and increase the sells on more than 30% (constated on our first marketing tests).